Throughout the party she flips between external observations and self-awareness/inner monologue — constantly scrutinizing and assessing herself and those around her. That's because Joni Mitchell's signature persona is that of... The Critic! She turns her laser-fine, high-powered perception on people, moments, interactions, situations, images, then anatomizes them, weighs them and judges them. And not always harshly or unsympathetically. Sometimes she'll "just let things slide," but never without examining them in detail first. And that's what makes her a first-rate critic. Who's POV is that last bit from? I like the ambiguity... And I love the defiant, disgusted reading of "And Harry's take-home pay" — as if she'd just tossed a wad of cash back at him and it flopped on the mattress. A lap dissolve on "Court and Spark" takes us from "Trouble Child" (narrated in the second person — or perhaps the institutionalized title character thinking in a dissociative third person) into Annie Ross's "Twisted," a comic first-person story about a kid convinced she's a genius (with cameos by Cheech and Chong!). It's a clever POV shift — from outside to inside the head of a "crazy" person. But the "Caligari"/"Psycho" twist, the punchline, is perhaps that the narrator of both these linked songs is the same schizoid person. A split personality, perhaps — a first-person with delusions of grandeur and a second-person who expresses empathy and encouragement for her (younger?) troubled self? Or did the "Twisted" girl grow into a "Trouble Child"? That's a hell of an atmospheric opening montage. I always think of the beginning of Billy Wilder's "The Seven Year Itch," or Hitchcock's "North by Northwest" (speaking of reflections in the windows of modern buildings. It's interesting that she connects a song about a pop star who feels ambivalent about her boho past to one about a middle-class husband and wife. He's a businessman and she's a homemaker, and they don't seem to be living the American Dream. Or are they? He put a quarter in the Wurlitzer, and he pushed Three buttons and the thing began to whirr And a bar maid came by in fishnet stockings and a bow tie And she said drink up now its gettin on time to close. This is one of Mitchell's finest performances, too. The way she snaps "I'm gonna blow this damn candle out..." and the way she imagines her "goooooooorgeous wings" soaring. This is great acting. Can you see him? I picture Warren Oates in the 1970s, with a stubble and a stogie, probably with a cowboy hat pulled down to keep the glinting sun out of his bloodshot eyes. 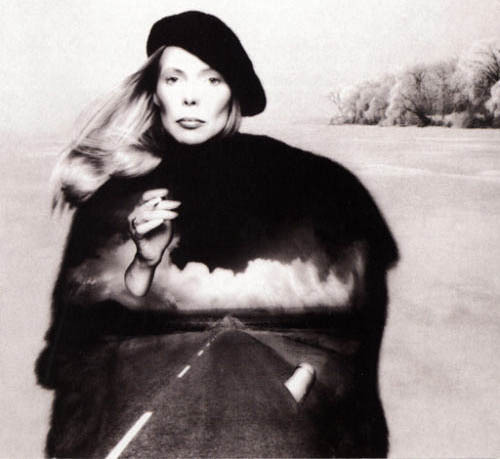 And, of course, that's another of Joni Mitchell's cinematic strengths: Good eye for casting. Check out Sean Nelson's 33 1/3 series book on "Court and Spark."